The end of another chunk of MARVEL UK history: the hefty (84 pages!) finale of THE SAVAGE SWORD OF CONAN THE BARBARIAN. Cover-dated July 1985, a ninety-three issue run seems remarkable longevity. 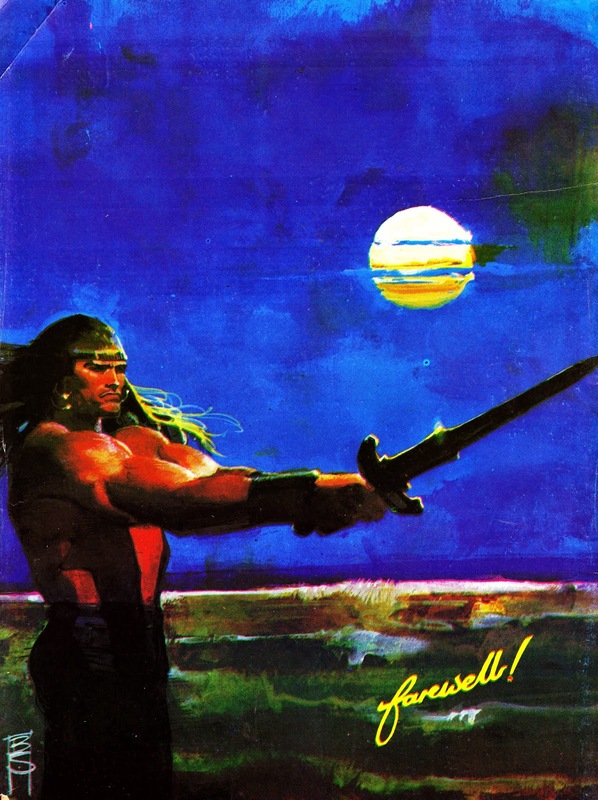 Even more so considering that the first volume of Savage Sword, published weekly, had been the British Bullpen's first significant failure: canned after a mere eighteen issues a decade earlier. The only M-UK monthly to surpass this run was, of course, DOCTOR WHO MAGAZINE which celebrated its 100th the same year… but that had the advantage of a 43 issue head start as a weekly. STARBURST MAGAZINE also soared way past the centenary mark… but only after M-UK had passed it onto Visual Imagination. 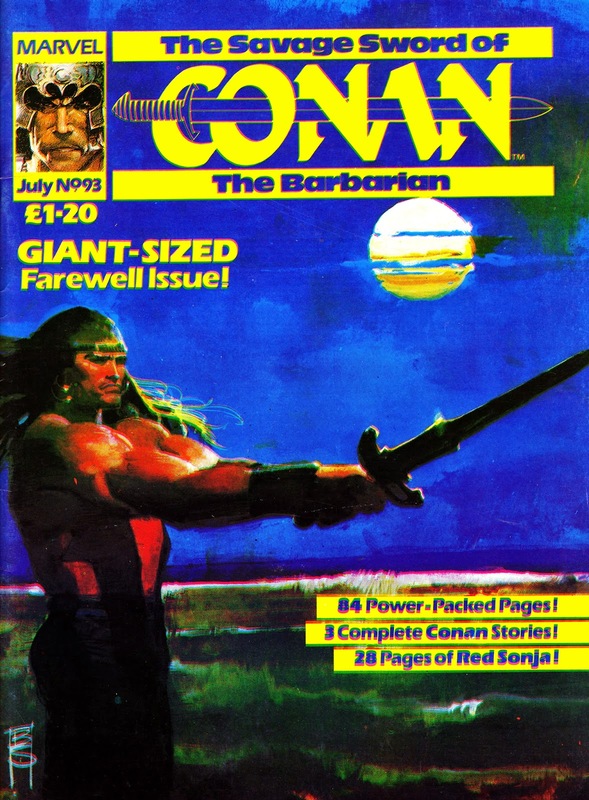 At his peak, circa early 1981, the Barbarian was appearing simultaneous in three titles: this monthly, the Pocket Book (also monthly) and in VALOUR/ FUTURE TENSE AND VALOUR. Conan's fortunes were no doubt boosted by the two early eighties Arnie outings (the adaptation of the second, CONAN THE DESTROYER, had graced the pages of the magazine from issue 85 onwards) which, in turn, had spawned a flurry of (not always terribly good) cinematic imitators. Ironically, SS was cancelled just as Conan's co-star Red Sonja was also making her (underwhelming) screen debut. Savage Sword had, for the most part, been left to do its own thing throughout the lifespan of the title. The only significant (and arguably ill-advised) intervention from the rest of the M-UK line being the merger of THE MIGHTY WORLD OF MARVEL spanning issues 85-90. Did this uncomfortable combination extend the life of Savage Sword by another few months… or hasten its demise as traditional readers turned away from the unwelcome infusion of the mainstream Marvel Universe? Conan had nowhere to merge (a sign of the times) but this didn't end his British run entirely. After a five year hiatus he returned as part of the line-up of the short-lived anti-heroes weekly HAVOC and then vanished again until the even-more-short-lived CONAN THE ADVENTURER.